Inhabitants of a Muslim enclave in France. While this is welcome news, it also prompts one to wonder: what of all those other Islamic enclaves, those unassimilated ticking time bombs that proliferate throughout the West, which are packed with ISIS-sympathizers, not to mention ISIS members, and which the West largely fails to recognize as such? I am referring to those many so-called “No-Go Zones”: Western cities and regions that have effectively become Islamic ghettoes. 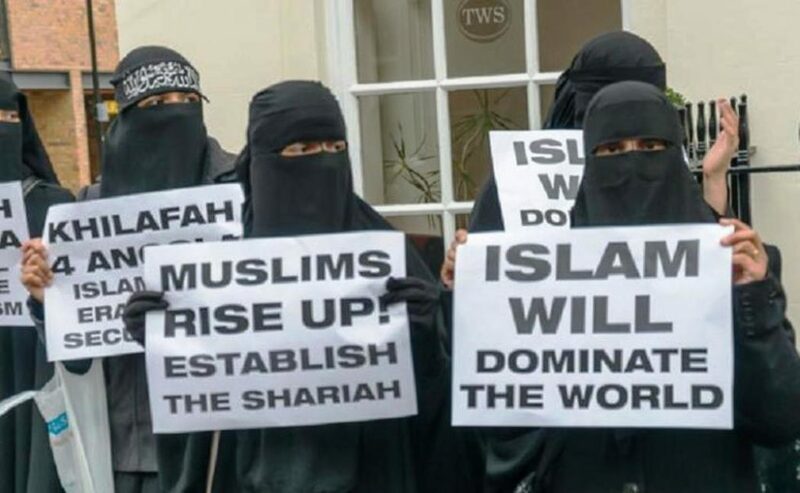 There, Sharia is the de facto law; Muslims are openly radicalized to hate infidels; non-Muslims, even police, are afraid to enter lest they get mugged, raped, or killed. In short, the ISIS worldview dominates—not in some distant theater of war, but right smack in the West itself (an internet search for terms such as “no-go zones” and “Muslim enclaves” demonstrates the prevalence of this phenomenon). Although these enclaves are unique to the modern era, they have precedents in history and even a nomenclature within the Islamic consciousness. Wherever the jihad was stopped, there, on the border with their infidel neighbors, jihadis formed strongholds, hotbeds of jihadi activities. These became known as the ribat (رباط), an Arabic word etymologically rooted to the idea of a tight fastening or joining and found in Koran 3:200: “O you who have believed, persevere and endure and remain stationed [رابطوا] and fear Allah that you may be successful.” In Islamic history, the ribat referred to the chains of jihadi fortresses erected along and dedicated to raiding the borders of non-Muslims. From the start of the Islamic conquests in the seventh century till the mid-eleventh century, the quintessential ribat existed along the Muslim/Byzantine border in Anatolia (modern day Turkey). There the oldest extant Arabic manual on jihad, Kitab al-Jihad (“Book of Jihad”), was compiled by Abdallah bin Mubarak. Born less than a century after Islamic prophet Muhammad’s death in 632, Mubarak committed his life to studying and waging jihad on the Anatolian ribat until his death in 797. According to a modern historian, Mubarak was a paradigmatic murabit: he “served as a model of zeal in volunteering. His piety and asceticism gave him enormous strength”—he was known to “bellow like a bull or cow being slaughtered” when warring on infidels—and “his fellows continued to be drawn to his power after his death.” His Book of Jihad remains a classic among militant Muslims around the world. With the coming and military successes of the Ottoman Turks, the Anatolian ribat continued edging westward, until it finally consumed Constantinople, the last bastion of the Byzantine empire, and most of the Balkans, reaching Vienna twice (in 1529 and 1683). It is permissible to set fire to the lands of the enemy, his stores of grain, his beasts of burden—if it is not possible for the Muslims to take possession of them—as well as to cut down his trees, to raze his cities, in a word, to do everything that might ruin and discourage him, provided that the imam deems these measures appropriate, suited to hastening the Islamization of that enemy or to weakening him. Indeed, all this contributes to a military triumph over him or to forcing him to capitulate. To keep the [northern] Christians in their place it did not suffice to surround them with a zone of famine and destruction. It was necessary also to go and sow terror and massacre among them. . . . If one bears in mind that this brigandage was almost continual, and that this fury of destruction and extermination was regarded as a work of piety—it was a holy war [jihad] against infidels—it is not surprising that whole regions of Spain should have been made irremediably sterile. This was one of the capital causes of the deforestation from which the Peninsula still suffers. With what savage satisfaction and in what pious accents do the Arab annalists tell us of those at least bi-annual raids [across the ribat]. A typical phrase for praising the devotion of a Caliph is this: “he penetrated into Christian territory, where he wrought devastation, devoted himself to pillage, and took prisoners”. . . . At the same time as they were devastated, whole regions were depopulated. . . . The prolonged presence of the Musulmans, therefore, was a calamity for this unhappy country of Spain. By their system of continual raids they kept her for centuries in a condition of brigandage and devastation. Why does this history lesson matter? Because in many respects, the Muslim enclaves and “no-go” zones that proliferate throughout the West function as embryonic ribats: hotbeds of radicalization and jihadi activities targeting their immediate infidel neighbors—that is, their European host societies. There is of course one crucial difference between history’s ribats and their modern day counterparts. Ribāts traditionally formed wherever Muslims could not, by force, go any further, thereby becoming frontier zones whence the jihad resumed. Conversely, today’s quasi-ribats—AKA “enclaves,” “no-go zones,” etc.—are not located on the borders of non-Muslim regions but rather in the middle of European nations; moreover, those entering in and turning these Western regions into Islamic enclaves did not do so by force of arms but rather because they were welcomed in with open arms. If Islam continues to grow in the West, and if Western peoples continue to retreat (in a myriad of ways), it is only a matter of time before the West’s many Muslim enclaves evolve into their most natural forms: ribats dedicated to waging full-blown jihad on their infidel neighbors—a scenario that makes the fall of the Islamic State’s last ribat in Baghouz pale in significance. Note: For more on the ribat, see author’s recent book, Sword and Scimitar: Fourteen Centuries of War between Islam and the West.